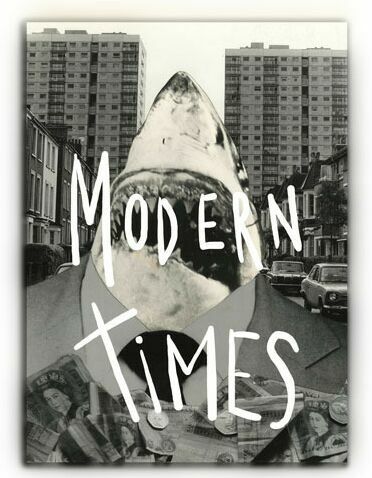 Billing itself as the UK’s “first graphic newspaper since the Titanic sank” Modern Times is an intriguing new project overseen by a three-woman team of Royal College of Art students. Fusing social commentary with graphic journalism the paper is currently looking for backing on Kickstarter. 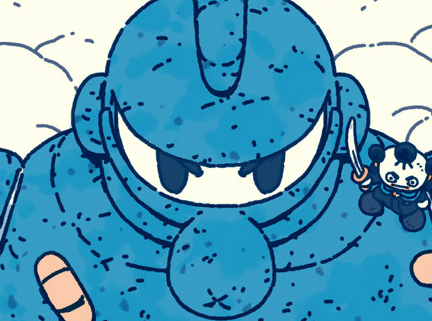 Counted amongst its first issue contributors are Isabel Greenberg and Tom Humberstone – long-term favourites of Broken Frontier’s ‘Small Pressganged’ column. BROKEN FRONTIER: To begin with, can you introduce us to the three-woman team behind Modern Times and your roles in the paper? 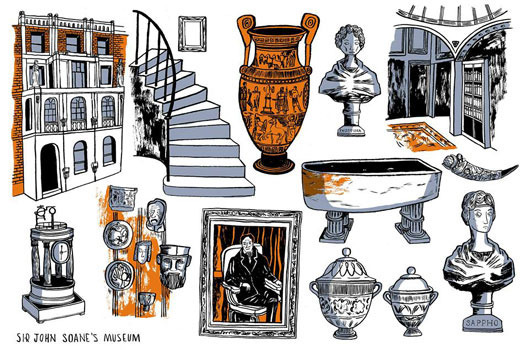 KATHERINE HEARST: Fionualla and I are postgraduate students of illustration at the RCA. 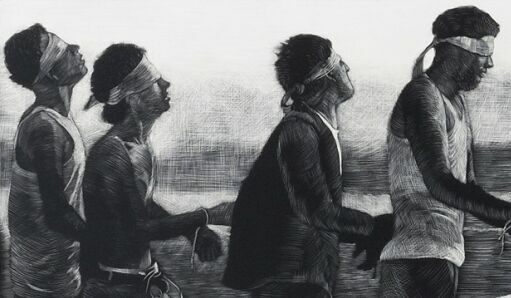 Our work centres around visual storytelling, through both filmmaking and sequential drawing. We share a love of comics and a desire to see greater political engagement in the fields of illustration and graphic design. We come up with potential themes, contact artists we want to work with, collate the final submissions and get busy promoting it. Biin Shen, a student of Information Experience Design at the RCA, is the designer. 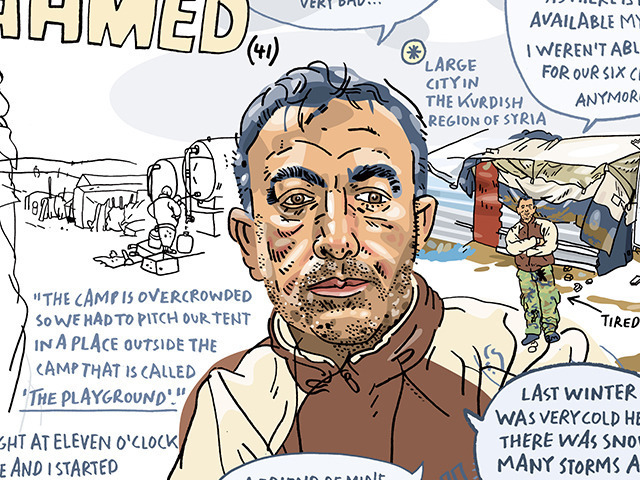 Inspired by the work of Joe Sacco, Olivier Kugler, the reportage illustrator Feliks Topolski, we wanted to provide a platform for the revival of illustrated journalism. BF: For those in our audience unfamiliar with the term, what is “graphic reportage” and what place has it had in journalistic history? HEARST: Graphic journalism really began with the phenomenon of the illustrated weeklies in England and the U.S around the 1830s.The artist was a journalist. The advent of photography quickly rendered the practice redundant, however, reportage illustration resurfaced with the work of Robert Weaver, Feliks Topolski and other artists who felt compelled to record and comment on the world around them. 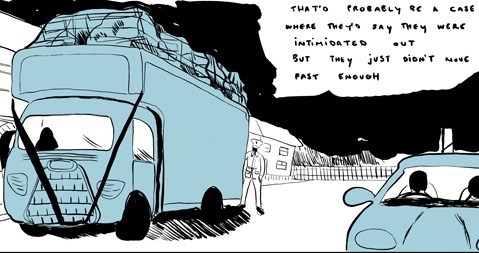 Comics journalism is gaining validity both as an art form and as a serious form of social commentary- Joe Sacco’s Palestine reveals the immense potential of cartooning as a vehicle for political and social commentary. Our scope is not limited to cartooning- the paper encompasses photography, illustration and writing. We are interested in combining different forms of journalism and exploring their potential in the field of reportage. BF: What was the genesis of Modern Times as a project and what are your primary aims in championing this form of journalism? HEARST: I am really interested in the documentary potential of illustration. My dad’s a journalist, and while I’ve always wanted to be an illustrator, the process of researching a story and conducting interviews really appeals to me. The idea of starting a ‘graphic newspaper’ sprang from a talk by the magazine, Le Gun at college. I was really inspired, and thought I’d like to do something similar, but instead of a magazine, I wanted to produce a newspaper ; a publication that unites journalism with art. Fionualla and I got talking at a Joe Sacco lecture at the Comica Festival, and we began developing the project together. We sent out an open call for submissions at the Royal College and a number of other universities. Then began pestering our favourite illustrators for contributions. 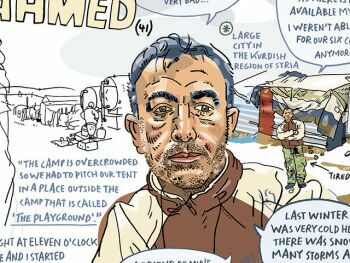 We were really taken aback at the generosity of the likes of Olivier Kugler, Tom Humberstone and Isabel Greenberg who have really helped to boost our profile. “In 2010 I directed and co-produced the documentary film Utopia London. It used the city’s public architecture as visual language to tell the story of London’s 20th century egalitarian dream. Graphic journalism is still viewed as ‘artsy,’ a medium that cannot provide a serious view of the world. The calibre of our content will speak for itself, but the scope of the paper is also impressive. The stories range from personal accounts of homeless shelters to memories of a childhood home. While we’re championing comics journalism, I want to emphasise that we’re not just interested in promoting cartoonists, we’re interested in a variety of documentary-based practices and how they can work together in one publication. 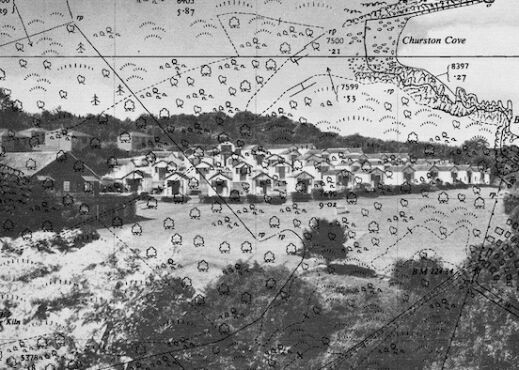 BF: The first issue is devoted to the theme of housing. What kind of issues can we expect to see tackled and how will they be approached visually? HEARST: The theme is intentionally broad to encompass a range of stories. Subjects range from the demolition of the Heygate Estate in Elephant and Castle to snapshots of homes from a road trip around the U.S. Our contributors have adopted very different approaches to their stories. Fellow student Kathryn Martin produced mock WPA housing posters from the ‘30s (see top image at the lead of this article), Olivier Kugler’s piece is a ‘graphic interview’ featuring portraits of his subjects surrounded by notations and quotes. The photographs and written articles contrast really well with the illustrative work. Purely from a design perspective, we thought this would be a difficult feat to pull off, but as it turns out the different pieces complement one another and provide an exciting visual contrast. 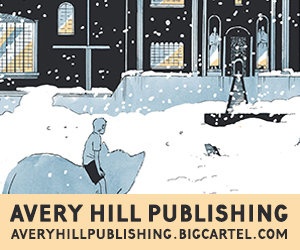 BF: You have an intriguing line-up of creators for the first edition including a number of comics creators who will be very familiar to Broken Frontier readers like Tom Humberstone and our 2013 Broken Frontier Breakout Talent Award winner Isabel Greenberg. Could you give us a rundown of the diverse nature of the contributors involved in your opener? HEARST: We wanted a very broad range of contributors, not only mixing big names and emerging artists, but people from different backgrounds, with different viewpoints. Our writers and artists come from across the UK, Europe and the US with a diverse range of narratives. Because of our limited timeframe, we haven’t been able to fully explore the collaborative aspect of the paper, but it’s something we’re gong to concentrate on in the next issue. The majority of our contributors are artists, but in the next issue we want to invite more journalists to participate. This we hope will involve close collaboration between journalists and illustrators. BF:You rather intriguingly describe Modern Times as “From Our Own Correspondent crashing full tilt into RAW”. Can you elaborate on the kind of tone and vibe that you’re looking to create in the paper? HEARST: I had the radio show This American Life in mind when I came up with the idea for the paper. The show’s presenter, Ira Glass’ ethos that “great stories happen to people that tell them” changed my perception of journalism. The way the show collects stories relating to a central theme appealed to me so much, I adopted it for the paper. Like This American Life, we’re looking for great stories which can occur in everyday life… but we’re also looking for striking visuals. We’re striving to be a graphic version of This American Life. BF: What plans do you have in place for the subject matter of future issues? HEARST: We want to examine and portray social themes, that is, those things that preoccupy all of us : housing, healthcare, employment, transport. But much depends on the kind of stories that catch our eye, and the ones we feel are particularly relevant at that time. Nothing comes that easily, and I’m sure our next project will emerge after prolonged brainstorming sessions. BF: You boast a mix between renowned names like Peter Kennard and Olivier Kugler alongside cartoonists currently studying at the RCA. Are you consciously looking to bring together both established and up-and-coming creative voices in the pages of Modern Times? HEARST: I really think this is the most interesting way of doing it. This mix has increased our profile featuring big names, but we’re particularly interested in providing a platform for new talent. BF: From the pre-publicity there seems to be an emphasis on very personal social commentary. How integral a part of your mission statement is providing a platform to those who are not adequately represented in the mainstream press? In an age where there is less and less protection offered to the vulnerable groups in society, there is a greater necessity to give them a voice. 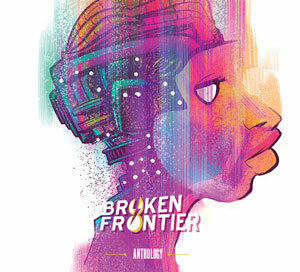 BF: The project currently has a Kickstarter page to raise funds for the debut issue. What’s on offer in terms of rewards for those who back you? HEARST: Rewards include free pdf versions and hard copies of the first issue, along with signed promotional material and an exclusive poster by Isabel Greenberg. “Woodberry Down Estate is formed of several Soviet-style blocks residing only a stone’s throw away from Manor House station in Hackney. Its foundations were first laid in the 50s when the socio-political climate immediately following the awesome destruction of the Blitz and the Second World War fostered a boom in the construction and provision of social housing.” – from Nicholas Hearst’s article on the planned demolition of the Woodberry Estate and the regeneration scheme in Hackney. BF: And, finally, where will interested readers be able to pick up copies of Modern Times later this summer should you reach that Kickstarter goal? HEARST: The first issue will be available to buy online, but we’re also aiming to have copies stocked in most major independent bookshop, comic, zine and art stores in London. For more on Modern Times check out their tumblr here. You can follow the project on Twitter here. And you can support that Kickstarter here. And they made it! Well done to the MODERN TIMES team on reaching their target! £14 away from its target!